Thanks for the kind words re: our mix of food, culture, and visuals! New look, new attitude (re: memes). Like it. Thank u very much for the mention. No! Really! Thank you, Robyn! Not so much new look, Ashwini. Same ol'. Same ol'. Don't seem to have the time to play with these templates. Pushpa, you help recreate some wonderful memories! Are those pear flowers? The pear tree in my yard is flowering, and looks really close. Gini, initially I wasn't sure that the young trees in my yard were Bradford pear trees. The beautiful white flowers sure looked like and smelled like the ones we have in Illinois. The fruit this tree bears is not like the regular pears we eat. I think - and I could be wrong - that the tree is called 'pear' more because it is shaped like a pear when fully-grown than for the fruit it bears. It is popular for its flowers and because it is disease resistant. 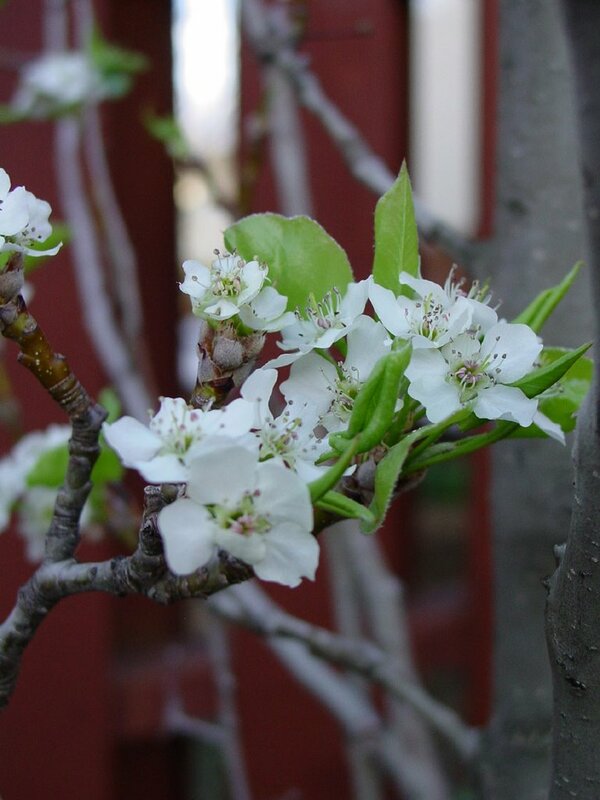 Some more pictures of the Bradford pear; the species is Pyrus calleryana. I guess they are not the ones I am talking about, 'cause the ones in my yeard produce the 'real' pears, but the flowers did look close. Thanks for all that explanation. Gini, you are so lucky! My trees are very young and are ornamental. Yours bear fruit you can eat! Try the wiki on pears to figure out which pear tree you have. "H4 syndrome", very funny! Your love for food blogging and the respect you'd show to your co- food bloggers is really shining through that comment. Is this new and different from Working Mom Syndrome? - where working Indian moms, trying to be cool and hip with ever present excuse of 'lack of time', both at work and at home to do anything and everything? Actually, Indira, it's not funny at all. Did you read the thread on AS? "H4 Syndrome" are not my words. In many states in the US, you cannot even get a driver's licence on an H4 visa. A driver's licence needs an SSN and on an H4, you can't get an SSN in many states; Illinois being one of them and my personal experience being one of them. On an H4, you cannot work nor drive (in some states it is possible to do the latter). Nor can they study full-time. Many don't know that they can volunteer and if they do know that, they don't know that they can't volunteer in an area that is related to their professional background. This has nothing to do with food blogging or Working Moms. It has to do with what women, who had extended families and friends around them in India, suddenly find themselves faced with when they move here on an H4. Please stop to read over at The Immigration Portal forums run by the Law Offices of Rajiv Khanna. There are many more serious issues that he is raising awareness for. One of which is what happens to the family of an H1B visa holder if s/he were to expire suddenly. The family falls out of status immediately and has a very short time to leave a country that most of them believed they would live in for the rest of their lives (because they have a GC application in process). Not only do they have to deal with the tragedy, the children go through a very difficult time as they have to go back to an education system and an unfamiliar world. Again, I can tell you from experience what that feels like. It feels like an endless dark tunnel with no light at the other end; you keep going because you have to and one day, you realize that you have to accept life for what it is. There is no going back. While there is a strong lobby for illegal immigrants, the general populace is unaware of what an H4 spouse undergoes in terms of isolation from society: can't work, can't drive, is totally dependent. Winter is a daunting prospect when the days are cold and dark. If the Indian food blogs that are emerging are a fallout of this situation, then that is something very positive that is happening. Because even if the women are physically alone at home, they are virtually connected or are connecting with one another through very strong bonding agents, culture and food. That is very comforting. "If the Indian food blogs that are emerging are a fallout of this situation,"
- I strongly disagree with your view, Manisha. I do think Indian food blogs are because of Indian women and men's innate love to share their food, history and culture with the world and not because they want to escape a "syndrome". The word "Syndrome" always associated with negativity and to indicate something wrong. Describing the wonderful, budding community of Indian food bloggers with this word doesn't look supporting and positive at all. I've read the AS forum as per your directions, except for the title, I didn't see anyone using this word to describe Indian food bloggers except you. Disagreements are always good. It makes for more diversity of opinion and therefore a lot of progress. In my opinion, of course! Indira, I posed a question in a discussion that has the title "H4 Syndrome". I don't know the answer to my question. I can postulate and conjecture but I don't have the answer. Somehow, you seem to understand posing of a question as labeling an entire community with the subject of the thread. If that's how you see it, that's your prerogative. I prefer to focus on the positive and work towards changing the negative or at least create an awareness . There is a lot that is wrong with the H4 situation, no matter which way you cut it. Denial never helped anyone change anything. As for positive and supportive, hey! I am a cheerleader for the food bloggers. If you wish to partake just the negative, that is your choice. However I do feel you are missing the larger picture. Above all the fluffy words, what I felt was the negative undertone, linking the budding Indian food blog scene with h4 syndrome, without any proof, (If you are keeping a tally of food bloggers visa status, please share and support your claim.) Not only here, also at AS forums repeatedly by you. Surprising and upsetting, because I do regard you in high esteem. I hope this is all unintentional. Keep rocking the Indian food. In the write up under caption "Food Blogger's Meme" the author has mentioned the name of Parande Aunty. The Author has also mentioned the delicious "methkut-bhath". Is the author connected with Dhantoli, Nagpur. I grew up on methkut-bhath. Isn't methkut a staple item in every Maharashtrian home? Sanjay, owning the home you live in is a great feeling, isn't it? You know, along with methkut-bhath, is waran-bhath. That's what we had for dinner a couple of nights ago. Sada waran (like the lagnathla waran), bhath and limbache lonche. Nothing else. It was bliss! Manisha, I agree with you that "Sadha Waran-bhath with ghee and limbache lonche" is ultimate. I do not know whether it is the quality/type of lentils or local water in Nagpur which emits a distinct aroma while cooking Sadha Waran. U don't get such aroma elsewhere. I am sure you will agree that another speciality of maharashtrian cusine is "Pithla Bhath". Sanjay, it is very interesting to hear/read you say that. I have a bunch of friends, Maharashtrian and Marwadi, from Nagpur who say the same thing! I don't think I've ever been to Nagpur so I can't say either ways! Do you have an authentic recipe for pithla? I have never tried my hand at it and would love to do so. No probs, Sanjay, you never know who may have a recipe tucked away, that was given to them by their grandmother or favorite aunt. I have found a couple of recipes for pithla and will try them out. With cold weather creeping in, pithla will be great comfort food! I am from Nagpur but by no means an accomplished cook. pithla-bhat is an easy to fix dinner for a cold and wet Sunday night. Just remember that you are going to cook besan in water and that a little besan makes a lot of pithla. you can try many varieties, though the simplest is as follows - add water to besan to make a thin slurry. heat oil, add dried red chilli peppers, mustard and hing. add chopped onions and saute them to whatever "done-ness" you like. add besan slurry and salt. reduce heat and let the besan cook. pithla splatters a lot during the cooking process, i recommend using a lid. keep stirring every few minutes otherwise besan will stick to the bottom of kadhai. variations galore! use buttermilk instead of water. or add tomatoes. may be green chillies. or chilli powder, if that works for you. you could fry methi leaves with onion. or add cooked drumsticks. good luck! PS> i am in a bit of a rush and haven't proofread this post. please excuse the typos. Interesting topics and discussion here. I stumbled upon your blog because I have one called workingindianmoms.blogspot.com and one of your pages always ends up as competition. If you get time, do read my blog on marathi nursery songs. I started it because I knew that my cousins who were married and settled in the US or UK were missing this treasure trove. 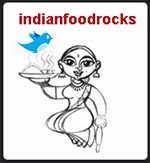 Since you are so passionate about marathi food and culture, I thought you would like my blog too. Please share with your friends too.